The Swop top soft cleaning brush has a soft brush but with side bristles and a triple surface face for maximum cleaning coverage, the bristles on the sides and edges making it easy to clean hard to reach areas. 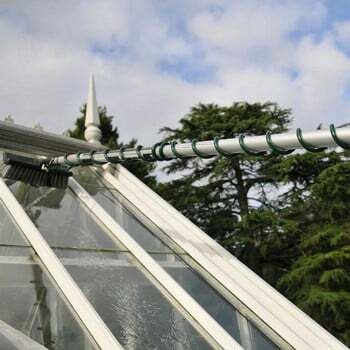 Spiral flow hosepipe will take water to the top of any “Swop Top” telescopic poles and has an on/off valve at the base. 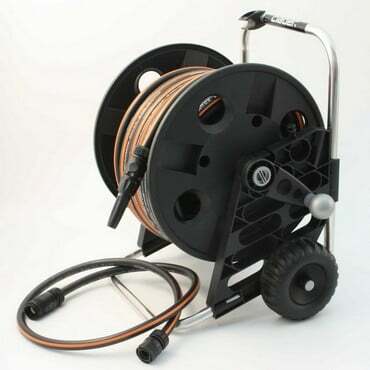 It wraps around the outside of the pole for leak-free operation and is held in place with two velcro straps. Used in conjunction with the Spiralflow Hosepipe, the Swop Top Soap dispenser allows for the use of 100ml liquid or powder detergent to clean windows, conservatories, soffit boards and gutters. But the Complete Set of 4 items for £72.80 and Save £5! 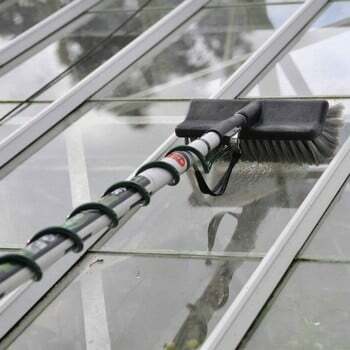 Finally I have the tool which allows me to clean my conservatory and greenhouse to a professional standard. Its straightforward to use and long enough to reach the sophists on the house roof. First remove the valve at the base of the Spiralfow and screw on the Soap Dispenser. 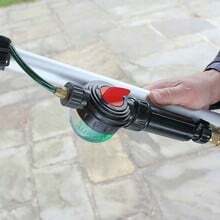 The base of the Soap Dispenser has a male connector which is compatible with most popular hose fittings. The black tap will turn the water on and off whilst the red selector opens up the soap compartment to fill and also alternates the flow between plain water or water with soap. 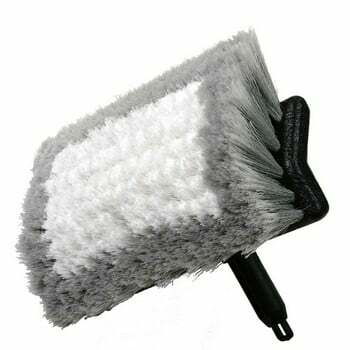 With the selector on water, turn on the black tap and thoroughly wet the area to be cleaned, then then the selector to soap for a very limited period. As soon as enough soap is visible, stop the water flow and spread the soap around the area to clean. Having turned the selector back to water, turn the black tap on again and rinse.